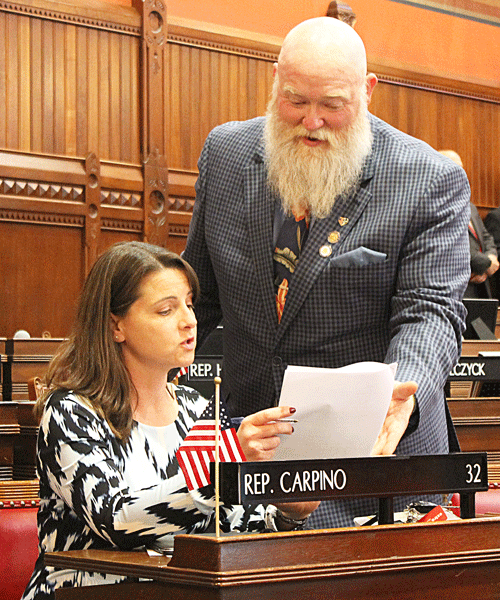 HARTFORD – State Representatives Bill Buckbee (R-New Milford) and Christie Carpino (R-Cromwell), along with several other House Republican members, have submitted a proposal that would cut pay to legislators, if the state budget is not passed by the statutory deadline. According to current state law, the budget must be passed by the final day of the legislative session. “Our first priority should be to pass a state budget. It is unfair to state residents and local communities to have to live in fear of reduced services, uncertainty, and the unknown without the legislature sharing the sacrifice. Regardless of the difficulty of the task, it is unacceptable to continue to be delinquent in delivering budget information to our cities and towns, businesses and taxpayers,” stated Rep. Christie Carpino. In the event a state budget is not passed by the final day of session, the proposal calls for all legislators and constitutional officers to have their salary reduced in proportion to the number of days that elapse before a state budget is enacted. When the legislature does not have a state budget by the final day of session, there are no punitive measures enforced on legislators or constitutional officers. The remedy is for the legislature to reconvene at a later date and vote on a tardy budget agreement. The extra session days come at an added cost to taxpayers. The true cost is to families and businesses in Connecticut that continually operate with uncertainty. The proposal currently sits before the Appropriations Committee. Reps. Carpino and Buckbee are calling on the committee to take up the support the proposal and vote to move it forward in the legislative process.